I maxed everything out, turned off the frame-rate cap and v-sync. The most immediate thing that struck me was the hitching—the game was hitching and stuttering hard in the loading screen, and continued with some frame-rate dips and hitches during gameplay. I turned antialiasing down from SSAA to FXAA and capped the frame rate at 90 and that’s smoothed things out somewhat, but the game definitely isn’t what I’d call smooth. I’ve encountered other issues as well. For starters, the mouse and keyboard interface isn’t nearly as easy to use as I’d hoped. The cursor functions identically to the console version, meaning you have to hold down the mouse button on every menu item you want to select and watch the “wheel” on your cursor fill up. I also alt-tabbed out of the game to check on another application and found I couldn’t get back in; it was still playing but the display was unable to show it. I had to exit the application and reload it, which meant I lost all of my progress since my last restore point save. Switching from fullscreen to borderless has removed the issue, though it’d be nice to be able to play in fullscreen, too. Steam reviews are currently “mostly negative,” with players reporting issues along the lines of the ones I’m seeing. 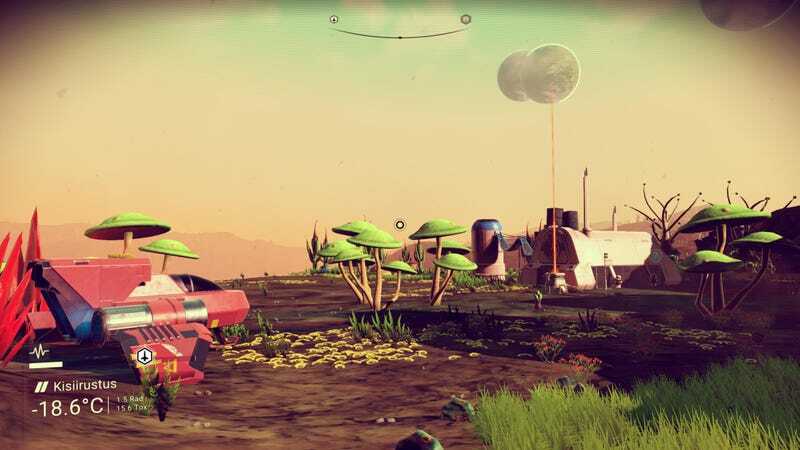 A bunch of people have been reporting that the game crashes at startup or won’t load at all—there’s a well-populated thread at the No Man’s Sky subreddit with loads of players reporting that issue and others. Game director Sean Murray has been addressing some of the issues on Twitter, and the game has already gotten one patch. Hopefully that patch helps some of the players who couldn’t get the game to load. The speed with which it was deployed indicates there will be more patches to come, so that’s good. There’s definitely a possibility that some combination of game updates and new drivers could get No Man’s Sky running better, but for now, it’s a far cry from the PC version many fans were hoping for. Bummer. Whilst many people are enjoying No Man’s Sky, we are tracking several issues, and we’re working hard to resolve them as quickly as possible. Update 8/15/2016: The PC version is still in generally rough shape, but by opting in to the experimental branch and with a few tweaks, I’ve been able to get it running a lot more smoothly. (I have a pretty powerful PC, so your mileage may vary.) The most popular tweaks have been assembled in a helpful post on the No Man’s Sky subreddit.